In the previous section, we have created a console project. Now, let's write simple C# code to understand important building blocks. Every console application starts from the Main() method of Program class. The following example code displays "Hello World!!" on the console. The following image illustrates the important parts of the above example. Let's understand the above C# structure. The Main() is a method of Program class which is the entry point of the console application. String is a data type. 'message' is a variable, that holds a value of a specified data type. "Hello World!!" is the value of the message variable. Console is a .NET framework class. WriteLine() is a method which you can use to display messages to the console. Every line or statement in C# must end with a semicolon (;). 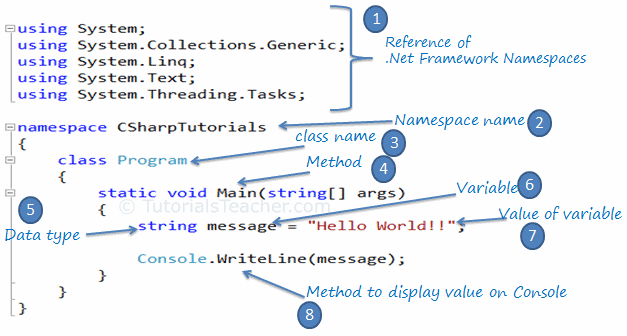 So this is the basic code items that you will probably use in every C# code. Let's learn about C# Class in the next section.